Nestled among stately cottonwood and mesquite groves, the championship course of Tubac Golf Resort & Spa was featured in the Kevin Costner film, "Tin Cup." I’m not sure what I admire most — their faith in human honesty or in our ability to cipher percentages. Driving south from Tucson, the desert doesn’t turn spinier and foreboding. Instead, it softens, becomes downright pastoral. Cactus-dotted slopes give way to rolling grasslands shaggy with mesquite. 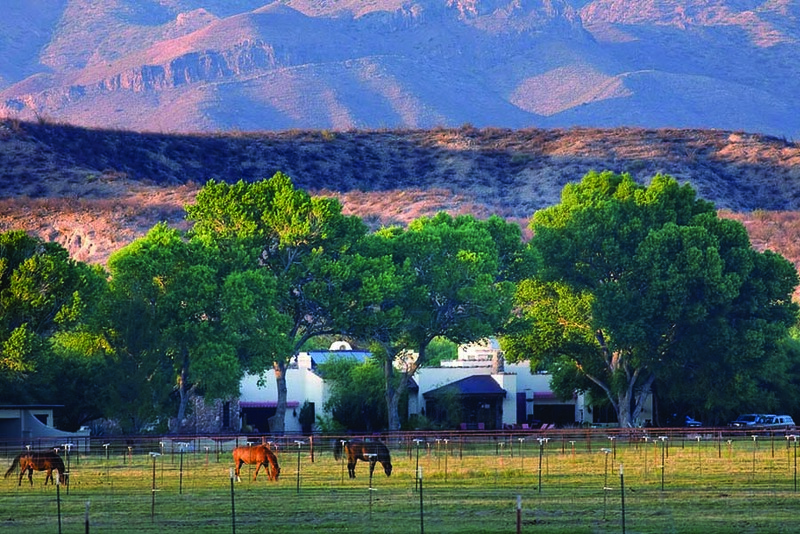 Tubac nestles in a high mountain-framed valley on the banks of the Santa Cruz River. Water flow in the Santa Cruz may be intermittent but ’round these parts, even good intentions are enough to create a delicious riparian habitat. 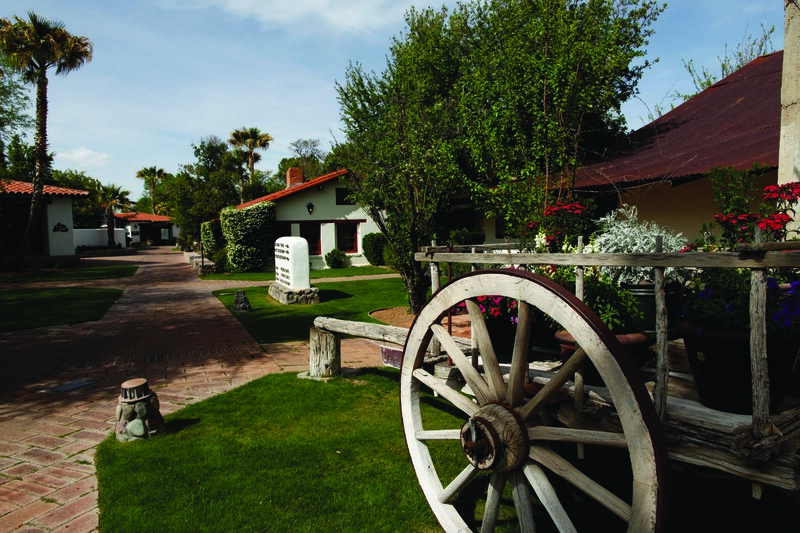 Today, 80-plus shops are clustered in the village plaza, where old adobes, Spanish courtyards and ocotillo fences blend seamlessly with a handful of newer buildings. There’s a whiff of emergent Santa Fe here without the jostling crowds. Tubac doesn’t even have a traffic light and I find myself falling into a relaxed rhythm as I prowl the district, focusing on art galleries. K. Newby Gallery displays an eclectic mix of Southwestern representational artists in the soaring space flooded with natural light. Surrounding the building is a sprawling sculpture garden alive with color and whimsy. The big steel animals of Fredrick Prescott, engineered to sway in the wind, and the hypnotically twirling kinetic sculptures of Mark White create a visual kaleidoscope amid the mesquite grove. Rogoway Turquoise Tortoise Gallery pulls you in with an appealing design that is both stimulating and soothing. There’s a cheeriness to the uncluttered shop that stays with me. 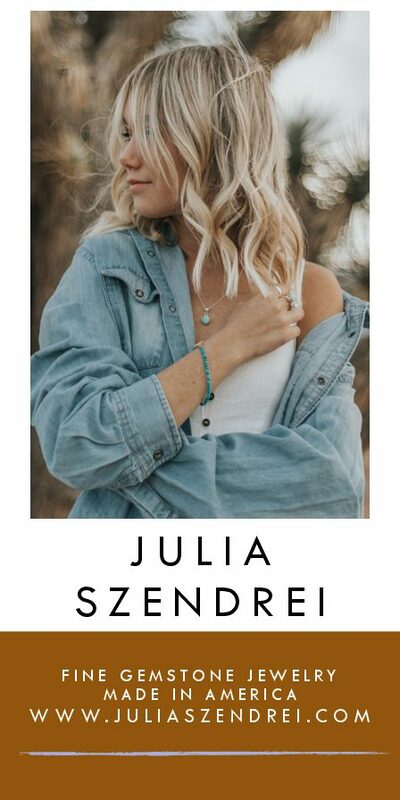 Eye-catching contemporary pieces line the walls like the long, lean Western silhouettes of Manny Valenzuela and glass cases of beautiful handcrafted jewelry. 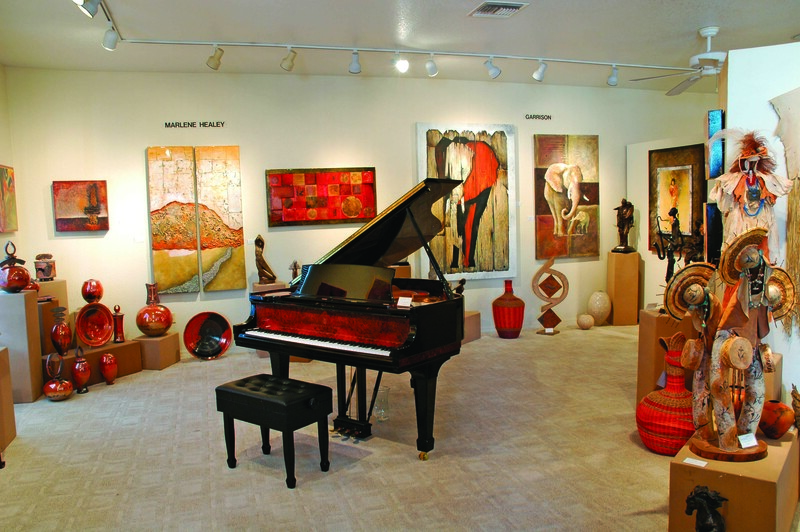 Big Horn Gallery is known for traditional and contemporary Western styles with a regional flavor blended in. Darcie Peet’s true-to-life depictions of the Sonoran desert landscape and Richard Iams’ big oils of the Grand Canyon awash in a delicate light never fail to captivate me. But one of my favorite artistic collections isn’t in a gallery. Designated as Arizona’s first state park, Tubac Presidio State Historic Park preserves the original ruins of the old fort, still visible in an underground exhibit. 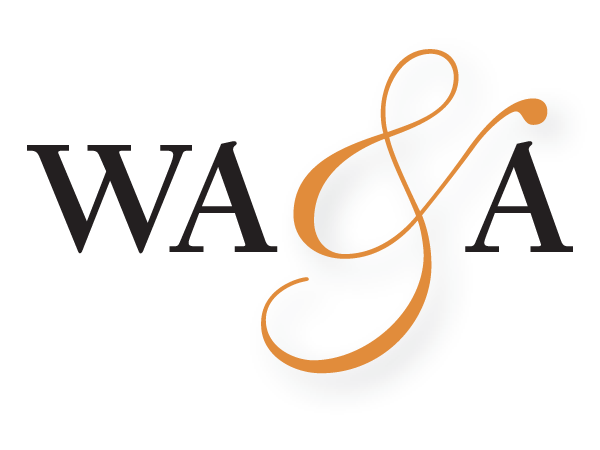 Visitors will also see an impressive museum that houses Arizona’s first printing press, a furnished 1885 schoolhouse and the newest exhibit: 16 epic paintings by William Ahrendt. Arizona Highways featured Ahrendt’s lush paintings in a “Cavalcade of History” series from 1987–90. Now 16 giclees on canvas vividly depicting the state’s past are displayed together for the first time. It’s a striking display and I move at a glacial pace from one to the next, soaking in the rich details. Three miles south of Tubac, Tumacácori National Historic Park protects the ruins of three Spanish mission communities. The main unit includes the Tumacácori Mission Church, which was never completed. Yet it is a profoundly moving experience to enter the sunlit sanctuary and stand in this quiet place. Behind the church is the mortuary chapel and cemetery. The visitor center contains a museum that puts a staggering amount of history in perspective. Driving back to Tubac, I stop at Tumacácori Mesquite Sawmill, one of those unexpected gems. Thanks to an arrangement with the Bureau of Land Management, the family-run, eco-friendly workshop collects velvet mesquite trees being removed to restore natural grasslands. Instead of going into burn piles, the wood is turned into unique doors, tables, benches and cabinets. Even scrap pieces are converted into lovely cutting boards. They also sell raw lumber to artists and hobbyists. Tubac doesn’t offer many lodging options but who needs choices with such plush comfort available? Tubac Golf Resort & Spa occupies the historic Otero cattle ranch, part of the first known land grant from the King of Spain. In 1959, Bing Crosby and cronies bought the ranch and started the golf resort. Original buildings have been incorporated into the elegant design and the resort embraces its ranching heritage. (Cattle grazing in the rough can create an extra challenge to golfers.) Recent renovations added luxury haciendas that feature beautiful tile work, sunken living rooms, walk-in showers, fireplaces and patios. While a guest of Tubac Resort, be sure to enjoy the excellent dining at Stables Ranch Grille, housed in the original ranch stables. Enjoy fork-tender steaks and surprising seafood specialties, as well as lavish views from the dining room that features rock floors, hand-hewn beams and a bar where restored saddles serve as barstools. There’s another fine dining restaurant in town. Elvira’s is a treat for the eyes as much as the stomach with a festive blend of Mexican arts and crafts dominating the decor. Chef Ruben Monroy is known for complex mole sauces, often concocted from an unexpected medley of ingredients. Yet the end result is a triumph of innovation, like the moist chicken breast painted with a dark mole of hazelnuts, almonds, walnuts, chile ancho and chocolate. 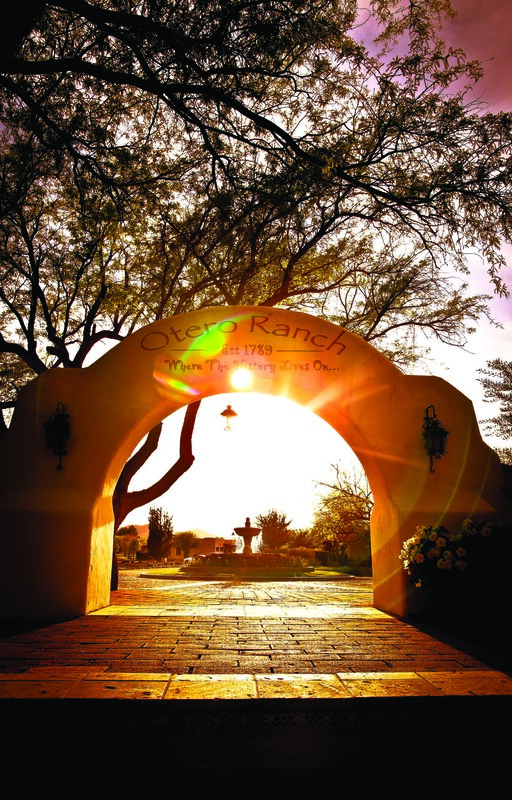 The Tubac Golf Resort & Spa is located on the historic Otero Ranch founded in 1789. Rogoway Turquoise Tortoise Gallery is one of 80-plus shops, studios and fine art galleries clustered in Tubac village. 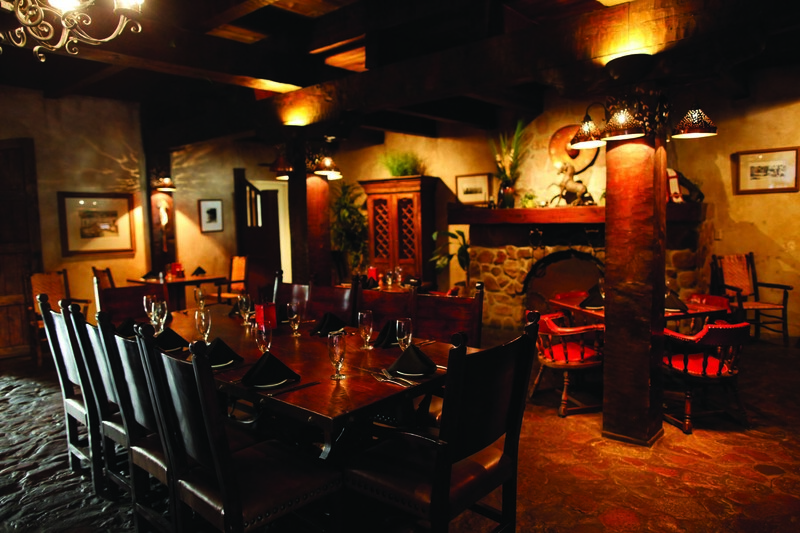 Guests at Stables Ranch Grille enjoy exquisite dining in a casually elegant setting. 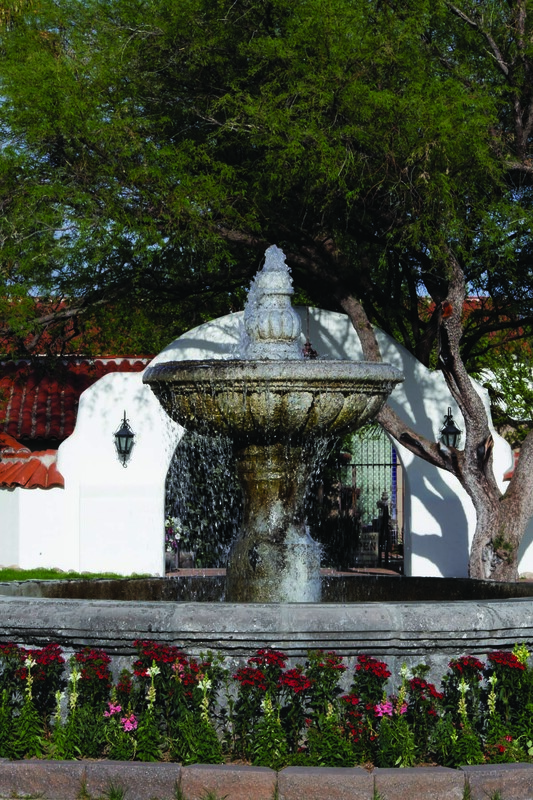 Accommodations at Tubac Golf Resort & Spa feature Spanish Colonial architecture enhanced with luxury flourishes. Elements of Tubac’s Spanish Colonial heritage are visible in the architecture. Perched on the banks of the Santa Cruz river, Tubac is surrounded by tree-dotted grasslands that lap against the base of rising mountains.